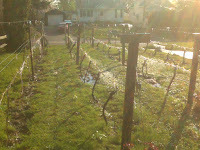 Backyard Vineyard & Winery: Warm Spring, Early Budbreak and...FROST! Warm Spring, Early Budbreak and...FROST! 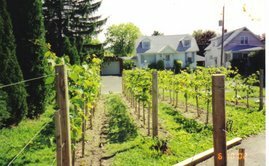 Warm weather never seems to come fast enough in the vineyard. You finish pruning, get the vines tied, perform any needed trellis repairs and then it's all about waiting. It always seems like the warm weather will never come. It takes aboout a week of temperatures around 50-60F to bring on budbreak. It's like watching paint dry! This year there was no waiting, the warm weather came on quick. From around the 10th of April the daytime temperatures began rising into the mid 70's. Within a few days the low 80's were here, and it lasted more than two weeks straight. With temperatures running 15-20 degrees above normal, it was a beautiful start to the growing season. Nevertheless, I was concerned. You see, these warm temperatures brought budbreak to my vines a solid two weeks earlier than normal. Great you say? Well in some ways it is great, but in one particular way it's not. Around these parts, the average last frost is somewhere around May 5th-10th. What this all means is that as long as any threat of frost (temperatures below 32F) exists, any green growing tissue is at risk of being killed. 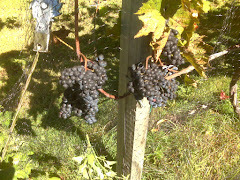 The first things a grapevine bud produces is a couple of leaves and then this years fruit clusters, albeit embryonic. Now if those infantillic clusters are hit by frost, they will likely die and dramatically reduce or eliminate this years crop. So what do you do when early budbreak or late frosts threaten your vintage? In France they set out metal drums to burn fires in the vineyard all night long when frost threatens. In California, large fans which keep the cold air from settling in, are run through the night. 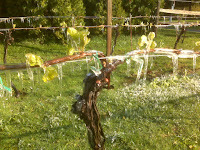 Still other growers run sprinklers through the night causing water on the vines to freeze over the tender growth. That's what I do. 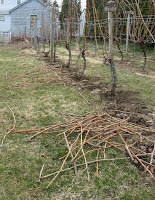 Yes, you did read that correctly; to protect my grapevines from frost I coat them with a layer of ice. It works because as the water freezes it releases latent heat. Not much mind you, but enough to get traped between the green tissue and the ice and keep the vines protected as long as it doesn't get too cold (below 28F on average) or stay cold for too long (more than a few hours). I was surprised to learn that this would work, but I tried it and it has worked every time I've used it in the past 7 years. This year's early budbreak put me in a frost threat situation last Wednesday, April 30th. So I set up my sprinklers and turned them on at about 11:30PM. It's always an anxious night with little sleep when there's af rost threat. I find myself getting up to look out at the vines and checking the temperature often. There have been a couple of nights over the years where I've run the sprinklers but the temperature never dropped below 32F. Not this time. By morning my vines were coated with a gleaming layer of ice. The vineyard looks so strange like this, almost eerie. Then all you can do is wait for the sun to melt the ice away and assess any frost damage. As usual, there was near none. Only a very few shoots were damaged and that's because the sprinklers didn't get them wet enough so ice could form on them. By far a successful frost intervention! It might seem a bit too much stress and effort to the average person, but this is the norm for grape growers. Most people would think that I'm crazy to have chosen a hobby that involves challenges such as this, but I love it. When you work, worry and nurture your vines through a year and you see that crop hanging as it ripens, then you know why you do it. Then when harvest comes and you crush the grapes and taste the sweet, succulent juice that will become this years vintage, you even begin to look forward to the next growing season. Of all plants, only grapevines and their mysterious power over humans can coax such loving attention from us. It's really amazing that we do it, but we do. I guess it must have just a little something to do with the finished product, you think? Great pictures!I amalways interested in looking at pictures of vineyards.